East Coast AC are proud to announce details of our Junior Cross Country Series, a three race Series aimed at promoting Junior athletics within the Borough of Mid & East Antrim. All three races will be in local venues and are open to EVERYONE! Just come along on race day and enter the event! Details of the three races can be found within this section. In order to qualify for the 'grand final' prize giving (after Race 3), all athletes must compete at least two out of the three races in the Series (best two results will be used where athletes have competed in all three events). All Stars Sports Academy are delighted to be the sponsors of this year's Series (www.allstarsni.co.uk). All Stars Sports Academy are determined to invest time in developing sport, and in particular, athletics for the children of Larne. They aim to provide children and young people with the opportunity to develop their athletic skills and also promote an active and healthy lifestyle. 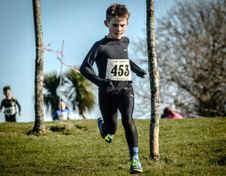 Dates for the 2019 Junior XC Series are now announced! Dates and details for the East Coast AC Series are shown below. Please note that these events are open to all juniors from all schools and all athletic clubs. - Prize giving for all ages after each race. - Overall Series PRIZE-GIVING will take place at this event - it will commence approximately 15mins after the final race of the day.